Three times holder of the Jules Verne Trophy and creator of The Race, the non-stop crewed race around the world without outside assistance and without limits, Bruno Peyron has officially announced that he has decided to relaunch The Race. After several months of studies and some careful thinking and after consulting the main potential competitors, a second edition of the race around the world for the giant G-class boats is therefore planned for 2013-2014, starting from a port in Southern Europe. Bruno Peyron, who took some time to think about this before coming to a decision explains: "As I've been able to stand back and gain some perspective since I last took part in the Jules VerneTrophy, there are several things I noticed that led me to take this decision to relaunch The Race. 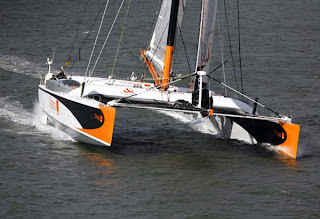 First, since the recent America's Cup that we have just seen, we can conclude that we French are no longer alone in the world of multihulls and that is excellent news. We are entering a new era. We can see too that since The Race, 12 giant multi-hulls have been built, including four in the past three years. So today there are certainly enough boats of sufficient quality for us to propose this event relaunch to their skippers and partners, without counting any new multi-hulls, which may be built following on from this by 2013 or 2014. I have noticed that some major brands have been looking at the possibilities offered by the Volvo Ocean Race, which I can fully understand, but this does indicate that there is simply no alternative international race for multi-hulls. And just to conclude, others around me have become aware of this and share this feeling and my discussions with the leading G-class skippers have led me to move things forward in this direction. After talks with various agencies specializing in sports marketing, Bruno Peyron has decided to award the overall management of The Race event to Thierry Reboul. Former Head of Advertising for Air France and Head of Communications at Alcatel, Thierry Reboul was the founder of the Ubi bene agency, which specializes in promoting events. He will in particular be in charge of organizing and negotiating with the main partners and the official event sites.